We have an enemy. He is real. He is mean. He hates God. He hates us. And His entire goal is our destruction. Sometimes he’s subtle, sometimes he’s overt. He’s good at what he does. So what does he do? When we look at Isaiah 14: 12-14 we see that Satan wants to exalt himself, he wants to be like God, he wants to be worshiped. He even tried to tempt Jesus by promising to fast track Jesus to greatness if Jesus would bow down and worship him. (Mt. 4: 8-9) Basically, he wants us to worship anything but God. If he can’t get us to worship him, he wants us to worship ourselves, to make self the center of our universe. He’s fine if we worship other people, sports teams, food, created things, cars, clothes, political parties, political figures, ideologies, etc. And his main methodology is to lie. Jesus tells us in John 8 that Satan is a liar, he’s been a liar since the beginning, and he’s the father of lies. I have fallen for his lies more than once. Some of the lies I’ve believed are that I’m invisible, I’m stupid, I’m ugly, I’ll never amount to anything, I’m friendless, I’m alone, I’m unlovable, I’m a bad mom, I’m a bad wife, I have to take care of myself, I’m unforgivable, God can’t use me because of my past— my list could go on and on. Many of the lies in this list have plagued me for years and can rear their ugly heads at any time. So, I must be sober and alert and recognize them as the attacks they are when they come. And here’s the subtle thing, if I choose to believe the lies, not only am I cooperating with Satan in my own destruction, I am also focused on myself. Absorption with self, whether negative or positive is self-worship. Ugh! John told us in his sermon that the word devour means to consume in order to replenish strength. That caught my attention. So if Satan is seeking someone to devour, he is looking for someone to consume so that he can replenish his strength. Put in those terms, I am absolutely certain that I do not want to feed him or participate in strengthening his destructive mission. Satan, the liar, has also convinced many that he is the “good guy” the “fun one”, and God is the stern mean one. How many cartoon drawings have we seen where Satan is portrayed as mischievous, but not evil, and God is portrayed as ready to throw lightning bolts? I’ve heard people blame God for all of the world’s evils and decide they’d rather spend eternity in hell with Satan than in heaven with a God who, in their minds, sends people to hell. They have believed a lie- a dangerous distortion- rather than embracing the truth that God loves us so much that He provided the only solution to hell in the death of His son. So, how do we overcome? Or, as the title of this sermon in the “Coming Apart” series is, how do we “come together” after things have fallen apart? We focus on the One who came to set us free. In Revelation 1:17, the apostle John has just described the image of Jesus that he is seeing, the one where Jesus has on a priestly robe, blazing eyes, white hair, and a sword coming out of his mouth. When John sees him like this, he falls down as if dead. He faints. Think about how interesting that is. This is John, the beloved disciple, the dear friend of Jesus. John who writes prolifically about the love of God, the grace of God, the nearness of God. But in this scene, John sees his friend in an entirely new way. He sees Him as majestic in power, as mighty, and even as scary—enough so that he ended up unconscious on the ground. And this resurrected, ascended, scary Jesus reached out his right hand, touched John and told him not to be afraid. I love that. The resurrected, ascended, all-powerful Jesus is still gentle and kind. Going back to 1st Peter 5, Peter tells us to resist the enemy who wants to destroy us by standing firm in the faith. He tells us that believers all over the world are suffering, and that we too will suffer. But in the middle of all of that he says that the God of all grace—stop for a moment and think about that phrase—the God of all grace. (Doesn’t sound like a lightning bolt God to me. )— this God of all grace has called us to his eternal glory in Christ. Stop. Think about that phrase too. He has called us to his eternal glory in Christ. 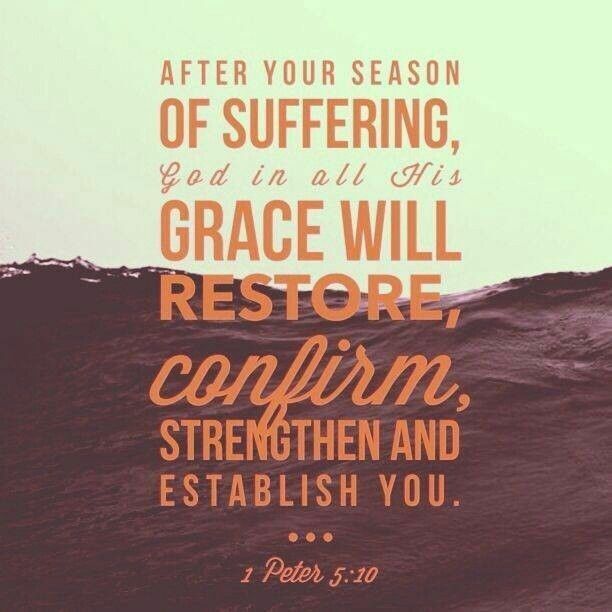 Peter continues by telling us that God himself will restore us, and make us strong, firm, and steadfast. Pastor John taught us this morning that restore means to mend—completely and thoroughly mend us—put us back together, full restoration. He reminded us that healed broken bones become stronger at the point of the break once they are healed. God will heal our broken places and make us strong, he will establish us by setting a new direction for us that realigns us to him. He joins us where we are and takes us someplace new. He will make us firm and steadfast meaning that he will hold us up, he will shore us up, he will put all of our broken pieces back together. Our part is to keep our eyes fixed on Jesus, to walk with Him, to spend time with Him, to believe Him, to trust Him, to follow His lead, and he will mend us along the way. The apostle John saw the glorified, all powerful Jesus, and it was so awesomely terrifying that he fainted. There is no doubt that scripture teaches about the almighty power of God. But guess what. His power is not against us, it is for us because He is for us. We must recognize the lies of the enemy that seek to destroy us and distance us from God, and replace them with God’s truth backed up by His word and the life of His son, and live from that place. One more thought—1st Peter 5 tells us that Satan prowls around like a roaring lion, but Revelation 5:5 tells us that Jesus is the Lion. The counterfeit lion leads the whole world astray (Rev 12:9); the real Lion leads us into relationship with the God of all grace. Be sober, be alert, know that there is one who wants to devour you, but never forget that he has been defeated by the One who came to save you. Hold on to Truth. He is holding on to you. Luanne wrote that “Satan prowls around like a roaring lion, but Revelation 5:5 tells us that Jesus is the Lion. The counterfeit lion leads the whole world astray…” The counterfeit nature of our enemy is not creative. Ingenuity is not his strength. He comes after us the same way every time: as a fake, a fraud, an imitation of the real thing. He is desperately grasping at what he once had-what he can never have again. In 2 Corinthians 11:14, we’re told that he “masquerades as an angel of light”. Oftentimes, he comes to us not in all his evil, hateful nastiness, but as something that looks almost good. He is not a creator-but he is masterful in the art of imitating. If we’re not careful, if we’re not deeply connected to Jesus and focused on Him, we can mistake Satan’s lies as the voice of our Savior. He’s that good at lying, friends. And he’s not only a liar-he is hateful and he is mean. So mean. If we begin to listen to his voice, we can begin to believe awful things about ourselves, about others and even about God. It made me cry to read my beautiful friend’s list of the lies she’s believed about herself. And I know Luanne’s list is not unique to her. I have a similar list-I’m fairly certain you do, too. The details of our lists are different, but the devil’s purpose is the same: To steal our God-given identities; to kill our purpose, our dreams, our hope, our faith; and to completely and utterly destroy us from the inside out. So what do we do? How do we defend ourselves against a liar who has perfected his craft? I thought a lot about the first words of the first verse John read to us in his sermon, out of 1 Peter 5:8. The translation Luanne used above tells us to “be alert and of sober mind”. The translation John read used the words “self-controlled and alert”. I rolled the words around in my mind several times as I listened. To defend against our very real enemy, we must be self-controlled and alert…so how do we do that? WE don’t. Thankfully, our gracious, loving God didn’t leave us to figure it out on our own. Not only is the incomparably great power that raised Jesus from the dead for us (Ephesians 1:19-20); that very power lives in us (Romans 8:11) in the person of the Holy Spirit. And the self-control we need to have to combat the devils’s scheming in our lives? It is a fruit of that Spirit living within us. We cannot muster up the self-control on our own. Our humanity will fail us if we try to beat our enemy in the flesh. But as vessels that carry the very Spirit of God Himself, we have all of the power of our Risen Savior to draw on, to lean into, to rely on. Absorption with self can also show itself in our attempts to fight our enemy on our own. Choosing not to draw from the endless well of power that we have access to through the Holy Spirit alive in us, choosing to wage war on our own, is not strength or courage. It is pride and foolishness and a win for our enemy as our focus is, once again, on ourselves. Search me, God, and know my heart; test me and know my anxious thoughts. The Spirit will reveal truth to our hearts-if we let Him. I am so grateful that we aren’t left alone to defend ourselves against our enemy. I’m grateful that baby Jesus grew up and that the Jesus I worship today is so powerful that His name alone makes demons scatter and flee. I love the tender, kind, gentle Savior He is to me–and–I love being reminded that His power is unmatchable, and totally FOR me and you. And pierce the clouds and bring us light. O come, Desire of nations, bind All peoples in one heart and mind. Bid envy, strife and quarrels cease Fill all the world with heaven’s peace. I pray that Jesus, who ransoms captives, who frees us from Satan’s tyranny and saves us from the depths of hell; Jesus, who gives us victory over the grave, who cheers our spirits, who drives away the dark of night; Jesus, who binds his people as one and destroys the quarreling and chaos and fills us with the peace of His heavenly kingdom–I pray that this Jesus will leave you in awe as you marvel at His power that is for you and alive in you. He is mighty to save us from the schemes of our enemy. Will we give Him the worship He is so worthy of? Will we lift our eyes from the chaos of our enemy and gaze into the face of the conquering lion? Our enemy has already been defeated. Let’s start living like we believe that’s true! This entry was tagged Power, Satan, Truth. Bookmark the permalink. WOW! The message the Lord anointed John to speak today wss so rich, I could not have imagined how it could have been enhanced, yet you BOTH blew me away with your insights. I watch my email each week for ENTER IN and I’ve yet to be disappointed. I will ponder these words all week. THANK YOU BOTH!